DNA contains the instructions for a living organism to grow and function. It tells the cells what role they need to play in the body. It gives instructions to make your heart cells beat, for your limbs to form in the right place, your immune system to fight infection and your digestion system to digest your dinner. DNA carries its instructions in a code made up of a four letter alphabet G, A, T, and C. The sequence of these letters is known as the genetic code. A molecule of DNA resembles a twisted ladder. Each rung of the latter is made up of two DNA letters. A always binds to T and G binds to C. The binding of the letters causes the whole molecule to coil up into a spiral staircase to form the double helix. 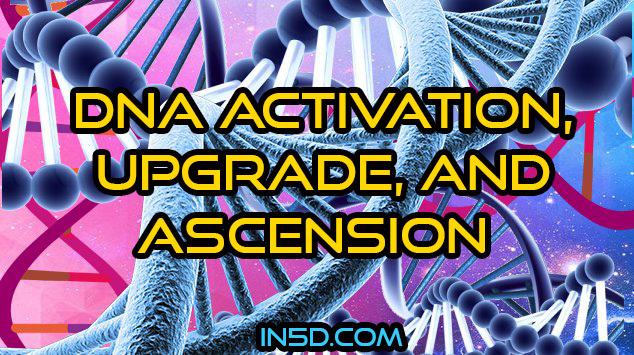 The Ascension process means the process of returning to 12 strands of DNA in our current human form. It’s the process which the human body’s vibration is elevated a little bit at a time until it’s vibrating at the resonance of unconditional love. During this process the 10 additional DNA strands are being reconnected within the circuitry of the body and the brain. So, as our bodies elevate in vibration and our new DNA is being connected our fear-based patterns and beliefs are being released simultaneously to make room for our, soon to be, higher vibrational existence. These additional 10 strands are our inter-dimensional strands, now you can see why we have been cut off from them for so long. We have two biological strands those are those two strands on the outside spiraling up, the inter-dimensional strands are the ones bridging those two biological strands and as you can see in this photo they’ve been cut. So that means those inter-dimensional strands couldn’t talk to our biological strands this is what has been done to us. We have been cut off from all of our inter-dimensional abilities through DNA manipulation, splicing and dicing as I call it. Basically, there are two biological strands with 10 inter-dimensional aspects within them. That’s how we arrive at the 12 strands. We always hear about the return of the “Christ” what it really means is those that will embody this new genetic code. Which means you will move beyond the limitations of human form. In moving beyond limitation you also move beyond fear. This means eventually our civilization will move into unconditional love and what a complete different existence that will be. We are also in the process of uniting the left and right hemispheres of the brain which was the way we were designed to be at the time of our creation! We will gain access to the creativity and abilities of those higher dimensions, meaning, all the wisdom and cosmic information which is stored within us. Basically, we are reconnecting with the information that has laid dormant in us for thousands of years!